The product has undergone a beneficial make-over. LiLash still comes in a standard, silver tube. It is decorated with the brand’s logo and a dark stripe below the cap. The cardboard box is now black and looks more elegant than the previous purple and blue version. What does the serum conceal? 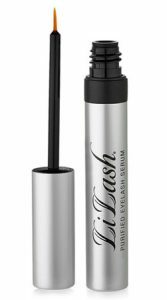 LiLash eyelash enhancer focuses on lengthening and curling your lashes. It doesn’t deliver immediate results. You must wait for the first effects. It’s a good option for the patient ones. It contains a few natural ingredients combined with the synthetic ones. It works as an eyelash growth product when we don’t need deep reinforcement. LiLash is suitable for those who have strong, healthy eyelashes that look forward to volume boost by adding a few extra millimetres. This serum also comes with a popular thin brush. You must remember that Lilash eyelash enhancer should be applied once a day. You mustn’t forget it because breaks in application weaken the effects. Before the application, it’s crucial to thoroughly cleanse the eyelids, removing make-up and impurities that settled during the day. It’s unsuitable for lower lashes. After applying the serum to the upper lash line, you must wait about 3 minutes before applying other cosmetics. The product works only for eyelash care. You can buy it together with LiBrow, which means extra costs. It is a must-have for those who want to enhance their lashes and brows. It’s worth mentioning: LiLash Serum is quite expensive when you consider its quality. Moreover, it doesn’t give permanent effects, which is noted on the official website of the product. – quickly and easily applied to the skin.